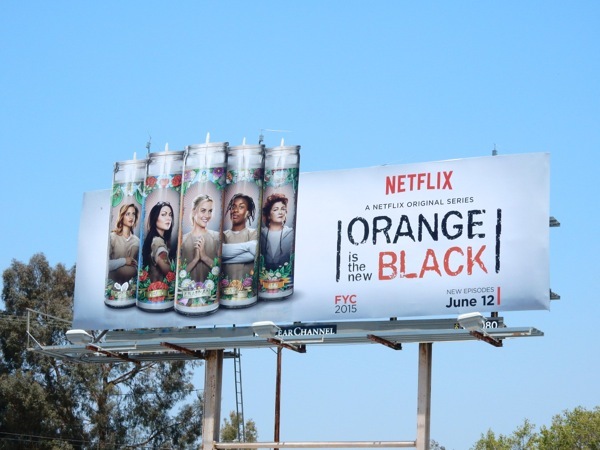 Are you ready to spend another season with the jailbirds of Orange is the New Black, as the engrossing Netflix prison comedy drama is back for a third season of binge-worthy episodes. 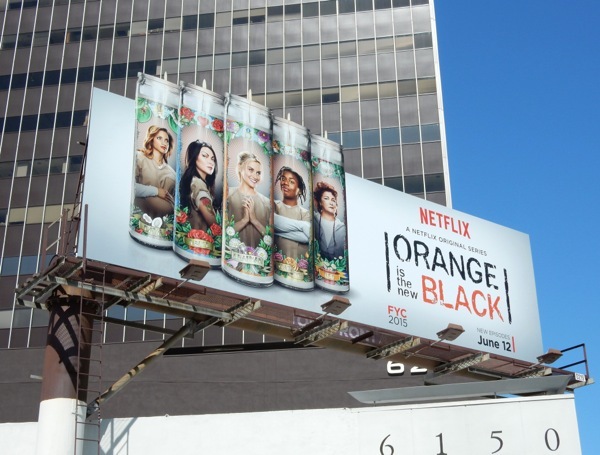 Taylor Schilling's 'Piper Chapman' may have thought the first two seasons were tough at Litchfield, but after setting things in motion for her on-again-off-again lesbian lover 'Alex Vause' to be caught breaking her parole, is she ready for the consequences with her return? 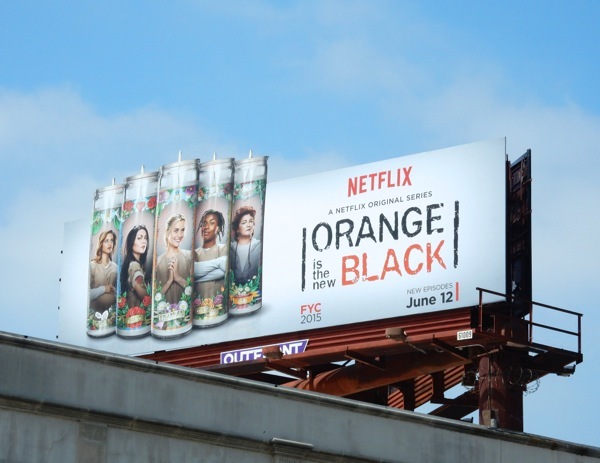 And after 'Vee's' shakeup of the inmates influence and relationships last season, maybe it's time to light a candle for all the insanity she left in her wake (and yes, we're thinking what 'Crazy Eyes' will do next). With pregnancies, power bases and prison guards, there's never a dull moment at this women's correctional facility. 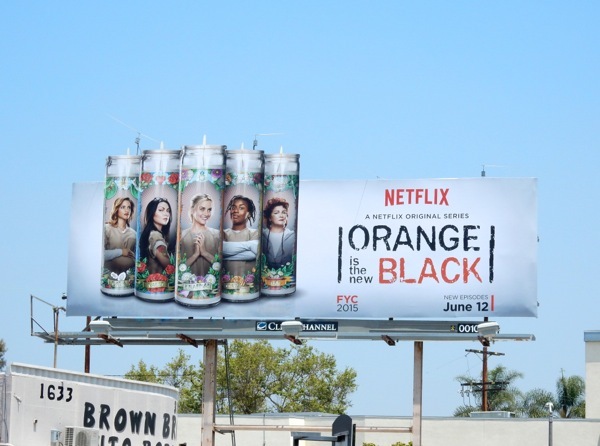 It's nice to see that they're having a bit of fun with these special extension candle billboards for season three, featuring prominent characters, 'Dayanara', 'Alex', 'Piper', 'Crazy Eyes' and 'Red'. 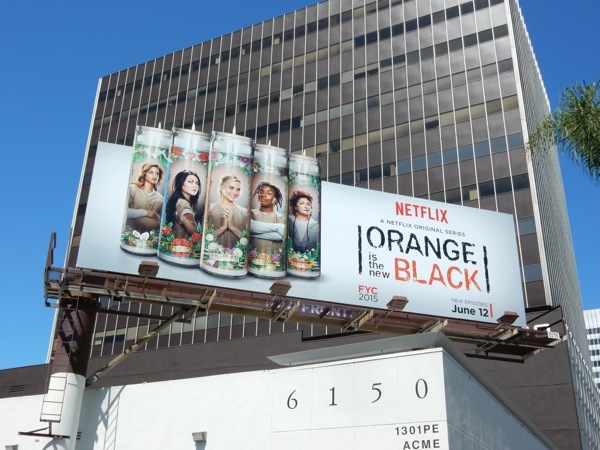 These eye-catching ads were were first spied high above Beverly Boulevard at La Brea Avenue on May 28, plus later along Robertson Boulevard on June 2 and Wilshire Boulevard on June 7, 2015. 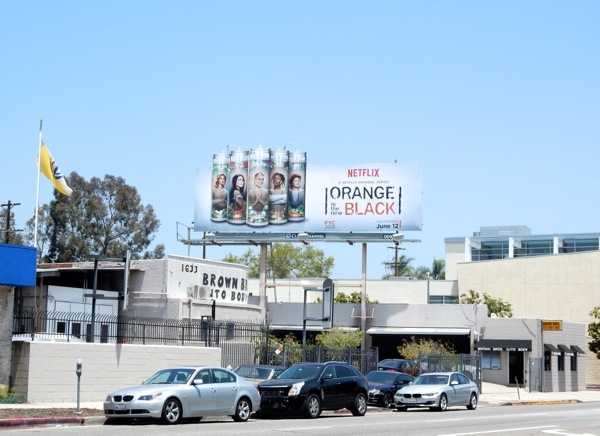 If you're a fan of the hit Netflix series, be sure to also check out these season one and two billboards for Orange is the New Black. 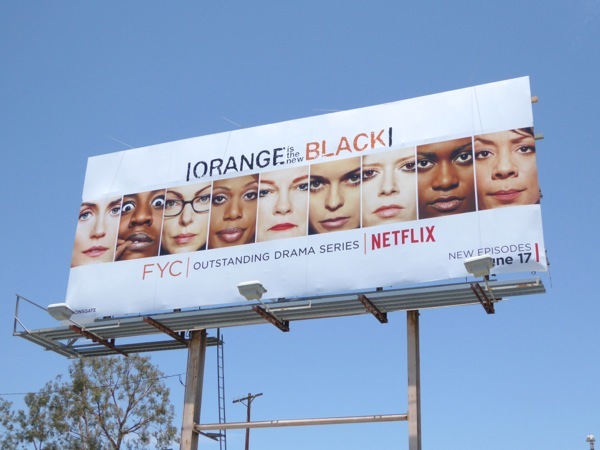 One thing's for sure, Orange is still most definitely in vogue, so be ready to watch all-new episodes this Friday. 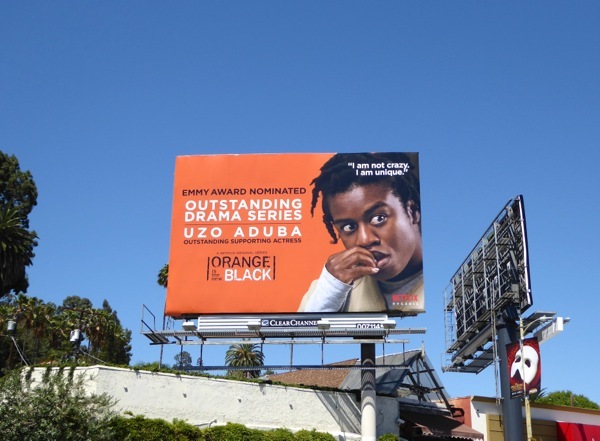 UPDATED: This season OITNB has been nominated for four Primetime Emmy Awards, including Outstanding Drama Series and Outstanding Supporting Actress for Uzo Aduba who plays 'Suzanne "Crazy Eyes" Warren' in the prison drama. 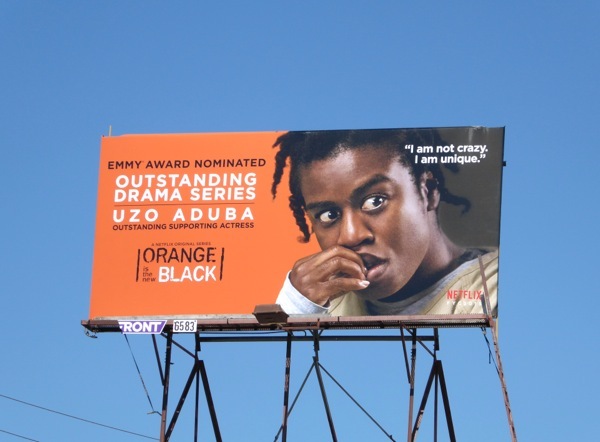 Here are some of the Emmy nomination billboards featuring the actress, hoping to garner TV Academy member votes this year. 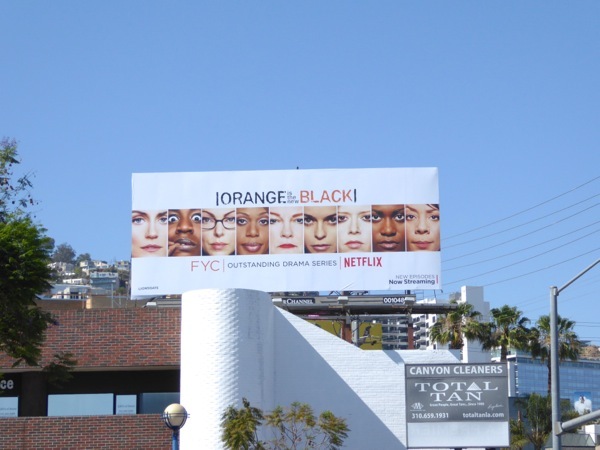 These eye-catching billboards were spotted along Santa Monica Boulevard, Melrose Avenue and Sunset Boulevard from August 15 to August 19, 2015. 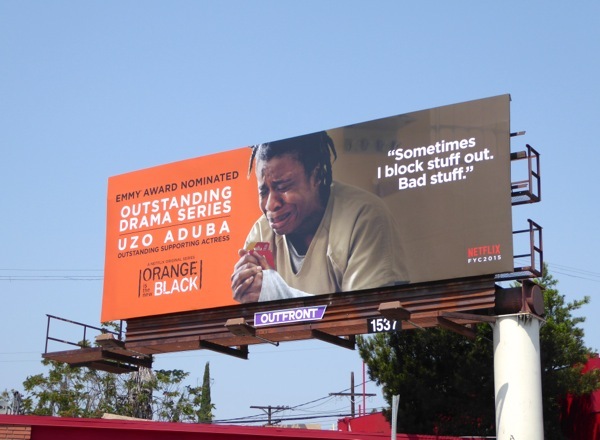 If you like these ads, be sure to check out the support for other shows from the 2015 Netflix Emmy nomination outdoor ad campaign like Bloodline, House of Cards and Unbreakable Kimmy Schmidt. 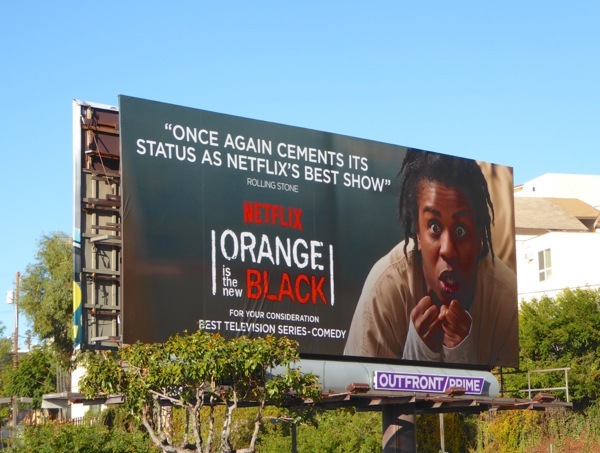 UPDATED: Another year, another awards season and here's another 'For your consideration' billboard for the third season of OITNB, spied along the Sunset Strip on January 7, 2016, which has been nominated for the Golden Globe for Best TV Series - Comedy or Musical and for Uzo Aduba for Best Supporting Actress. 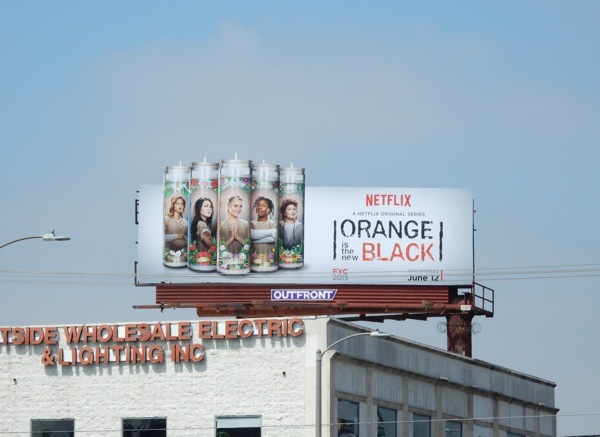 UPDATED: Here's also two examples of billboards from the show's 2016 Emmy consideration campaign. the use of of the character head shots takes a leaf out of the series opening title sequence, and let's face it, there are so many outstanding performances to choose from, how could you possibly decide? 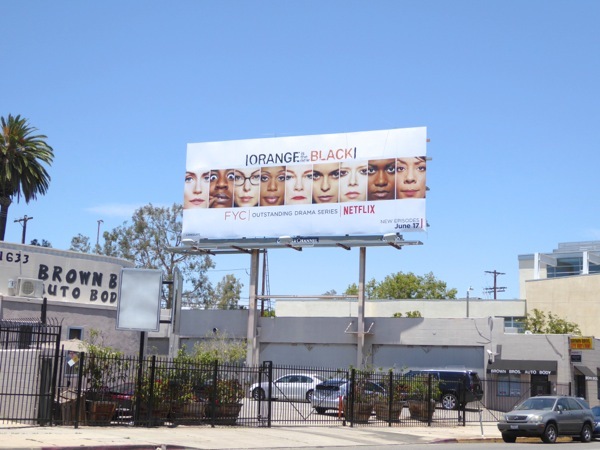 These OITNB Emmy FYC billboards were snapped along Robertson Boulevard and above Santa Monica Boulevard on June 19, 2016.